For 11 months of the year, the Stuff team wouldn’t say boo to a robo-goose. But then we get to our annual Gadget Awards issue, and they become more hyped up than a pre-fight Conor McGregor. Whether it’s Apple vs Huawei, Netflix vs Now TV or Red Dead vs God of War, there’s no shortage of passionate debates to be had over the winners. Thankfully, though, the only things bruised were a few egos, and everyone on the team can agree that each of our 21 categories has a winner that represents the very best in tech. 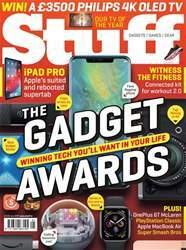 It all starts on page 30 – and also includes some great choices for Phone and Gadget of the Year from you, our readers.